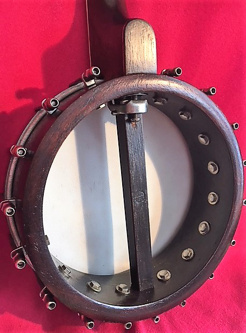 Vintage Slingerland banjo-uke, VGC, 1930s, a rare 'May Bell Premier' model. 8" diameter pot, 141/4" scale. Note the binding, inlays, engraved peghead veneer, layered and tasteful heelcap. 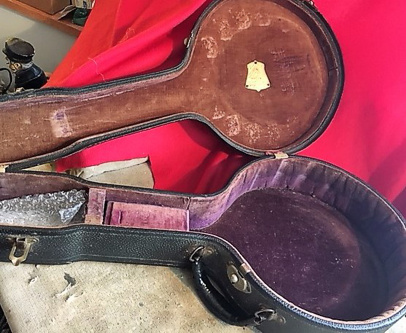 with the exception of the vintage tailpiece and replacement tuners. New UK-sourced vellum, Aquila strings and vintage bridge. 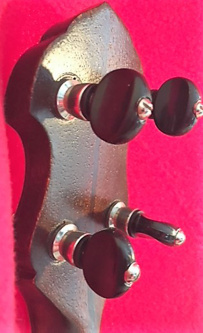 The tuning pegs were replaced at some point and the holes enlarged for larger shaft tuners. Ive replaced those other tuners with more appropriate ones, also larger shafted. This b-uke had a resonator and possible flange at some point. Plays and sounds great. Please contact me with any questions or for more photos. £30 shipping to UK and most EU destinations. Check with me for an exact quote. Im an experienced international shipper with several instruments sold through the Ukulele Market page. Click here for a demo video! Location: Minnesota (USA) Payment in US $ at the current exchange rate by PayPal.